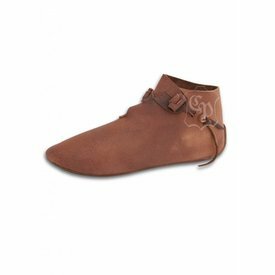 These Viking shoes are based on originals and fragments of originals excavated in Haithabu. Shoes like this were worn all over Europe between the 7th and 12th century. 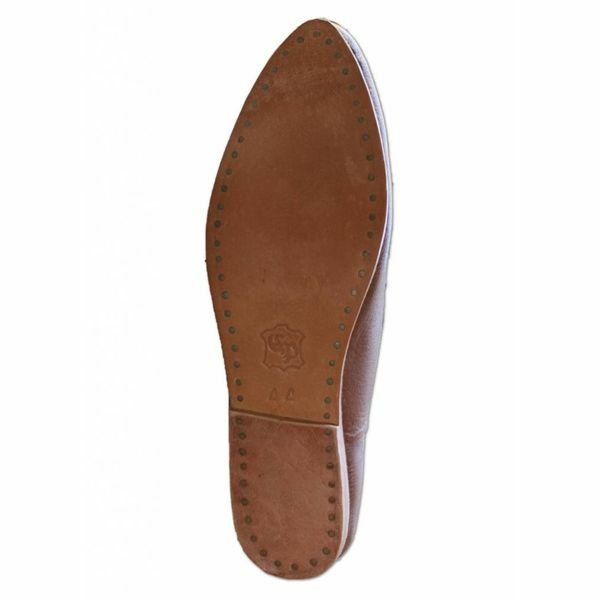 This type of shoe was relatively easy to be repaired and adjusted so they were popular for a long period. These Viking shoes have a 6 mm thick leather sole and it can be fastened with leather laces. These shoes are available in the sizes 37 up to 47. Advice: our shoes are only available in brown leather. However, they can easily be dyed another color with shoe polish or leather dye. You can also decorate the edges of your shoes with colored linen thread stitches. Are in doubt which size to choose? If you are in doubt, fill in your foot length and width in the last step of the shopping cart. We will help you find the correct size. Just like weapons you can treat your shoes and leatherware with a layer of Ballistol after use. This protects the leather from drying out.